Suspected in a child living in or traveling from a high-prevalence area who has fever, abdominal pain, and diarrhea followed by a reactive polyarthritis. Yersinia spp. are recovered from cultures of specimens of stool, mesenteric lymph nodes, blood, or abscess material. Inoculation of duplicate sets of cultures for incubation at 37 and 25 °C, respectively, enhances recovery of the microorganisms. Conditions that are associated with increased risk for Yersinia spp. infections (yersiniosis) include iron overload states (such as in patients who receive chronic blood transfusions or those with hemochromatosis) and the use of desferrioxamine, a bacterial siderophore. Infections caused by Y enterocolitica are more common in children than adults. The disease is more prevalent in northern Europe than in the United States. It is acquired by ingestion of contaminated food or water or by direct contact with an infected animal. The organism has been recovered from a variety of wild and domestic animals including pigs, rodents, rabbits, dogs, and horses, as well as from water and dairy products. The ability of the microorganism to grow at 4 °C allows it to survive in refrigerated food and dairy products. Y pseudotuberculosis infection occurs rarely. The microorganism has been recovered from many species of wild and domestic animals and from food, water, and other environmental sources. The disease is thought to be acquired by contact with infected animals or by ingestion of contaminated food. The disease is more common in Europe and typically affects children and adults during the winter months. Y enterocolitica or Y pseudotuberculosis are the pathogens of the nonplague yersiniosis. They cause a gastrointestinal infection that may manifest itself by diarrhea or fever and abdominal pain that mimics acute appendicitis. These microorganisms are gram-negative bipolar stained bacilli, nonlactose fermenting and urease positive. They are motile at 25 °C but not at 37 °C. They are iron dependent and grow well on conventional culture media at 37 °C and in normal saline at 4 °C. Y enterocolitica produces a heat-stable enterotoxin and lipopolysaccharide endotoxin similar to that produced by other enteric gram-negative bacilli. 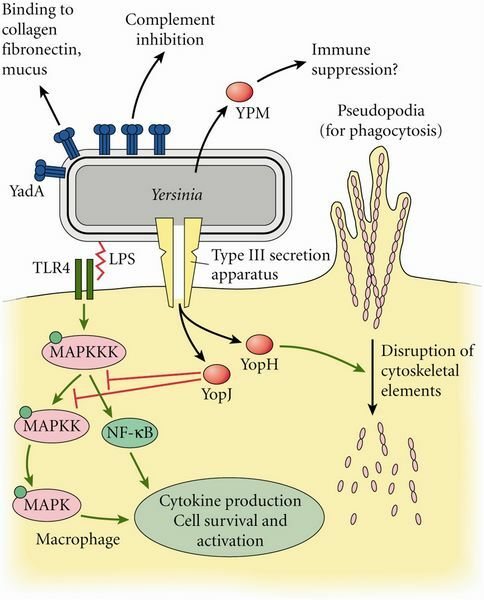 The virulence of Y pseudotuberculosis appears to be related to the production of a lipopolysaccharide endotoxin and to the ability to survive intracellularly. Yersinia spp. lack siderophores and are dependent on siderophores produced by other bacteria for growth. The portal of entry of Y enterocolitica and Y pseudotuberculosis is the gastrointestinal tract. These microorganisms cause terminal ileitis and adenitis. Pathogenic strains of Y enterocolitica cause mucosal ulceration and necrosis of Peyer's patches and therefore diarrhea. Bacteremia occurs rarely and is associated with suppurative lesions in the liver, spleen, and other organs. Reiter's syndrome is a reactive polyarthritis and occurs in 20%-30% of patients following infection with Y enterocolitica. Cross-reactions between the HLA-B27 antigen and the Yersinia antigen are postulated to be the underlying mechanism of arthritis. The spectrum of disease caused by Y enterocolitica and Y pseudotuberculosis is wide and may be divided into two categories: infectious (intestinal and extraintestinal) and postinfectious (Box 10). An intestinal infection is the most common manifestation. Typically, patients present with fever, abdominal pain, and diarrhea that is occasionally bloody for a 1- to 3-week duration. A clinical syndrome indistinguishable from acute appendicitis may occur in older children and adolescents. On laparotomy, thickening of the terminal ileum and cecal wall is present. The appendix is normal. Perforation of the intestine or dilatation of the colon with marked systemic toxicity (toxic megacolon) occurs rarely. Extraintestinal infections are rare. A septicemic syndrome preceding enterocolitis or associated with transfusions of contaminated blood has a mortality rate of 50%. The iron present in blood and storage at 4 °C are favorable conditions for the growth of Yersinia spp. Other extraintestinal manifestations include cutaneous lesions such as cellulitis, vesicobullous lesions, and other manifestations including diffuse lymphadenopathy, splenomegaly, and acute pharyngitis. Hepatic involvement is common in adults and can be present in two different forms. The acute form mostly occurring in patients with iron overload states is the result of involvement of the liver and sometimes the spleen with abscesses. The chronic form is characterized by a granulomatous inflammation in the liver and can be associated with a positive rheumatoid factor or a positive antinuclear antibody in the serum. The chronic form is thought to be secondary to an immunological phenomenon. Postinfectious manifestations include polyarthritis involving the weight-bearing joints and occurs in 10%-30% of Scandinavian adults with Y enterocolitica infection. Of patients with arthritis, 70% have the histocompatibility antigen HLA-B27. Arthritis begins a few days to a month following the onset of diarrhea and can persist = 4 months. Erythema nodosum occurs in 20%-30% of cases with arthritis. Other postinfectious manifestations include uveitis, glomerulonephritis, Guillain-Barre syndrome and the hemolytic-uremic syndrome. Laboratory findings are nonspecific and might include leukocytosis, anemia, and elevated erythrocyte sedimentation rates. The differential diagnosis of polyarthritis is wide and includes acute rheumatic fever, juvenile rheumatoid arthritis, Kawasaki disease, and other postinfectious arthritides. Diarrhea and mesenteric adenitis are usually self-limited, and antimicrobial therapy has not been demonstrated to affect the course of the infection. Immunocompromised hosts and patients with extraintestinal infections should be treated with antimicrobial therapy (Box 11). The optimal therapy is unclear. Yersinia spp. are susceptible in vitro to gentamicin, fluoroquinolones, trimethoprim-sulfamethoxazole, third-generation cephalosporins, tetracycline, and chloramphenicol. Empirical therapy with an aminoglycoside alone or in combination with trimethoprim-sulfamethoxazole, or a third-generation cephalosporin, or chloramphenicol is recommended. 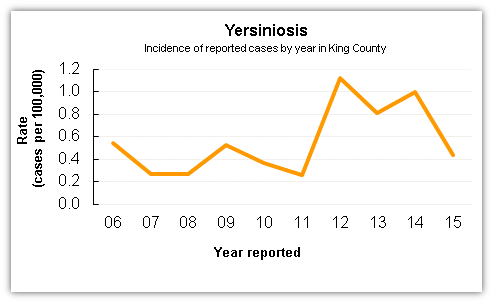 Mortality is rare, except in the septicemic form, where yersiniosis is associated with 50% mortality. Hospitalized patients with Yersinia spp. infections should be placed in enteric isolation (Box 12). Pasteurization of dairy products and proper cooking of meat or boiling water kills the microorganism in contaminated food. Contact with potentially infected animals in endemic areas should be minimized.